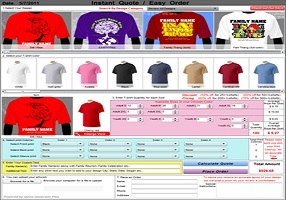 The Quote Generator system allows your customer to conveniently receive instant quotes and place orders online. 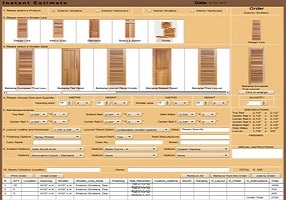 Quote generator helps cleaning companies sell services faster and more accurately. Quote generator makes your service and pricing more accessible to customers and helps you save time and increase your sales. 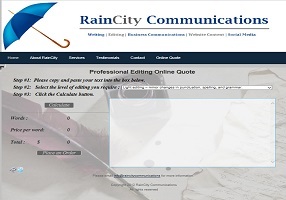 Provide instant quotes to your customer. 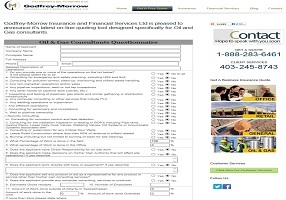 Instant online quote emailed automatically to you and to your customer. Work order to your assigned employee. 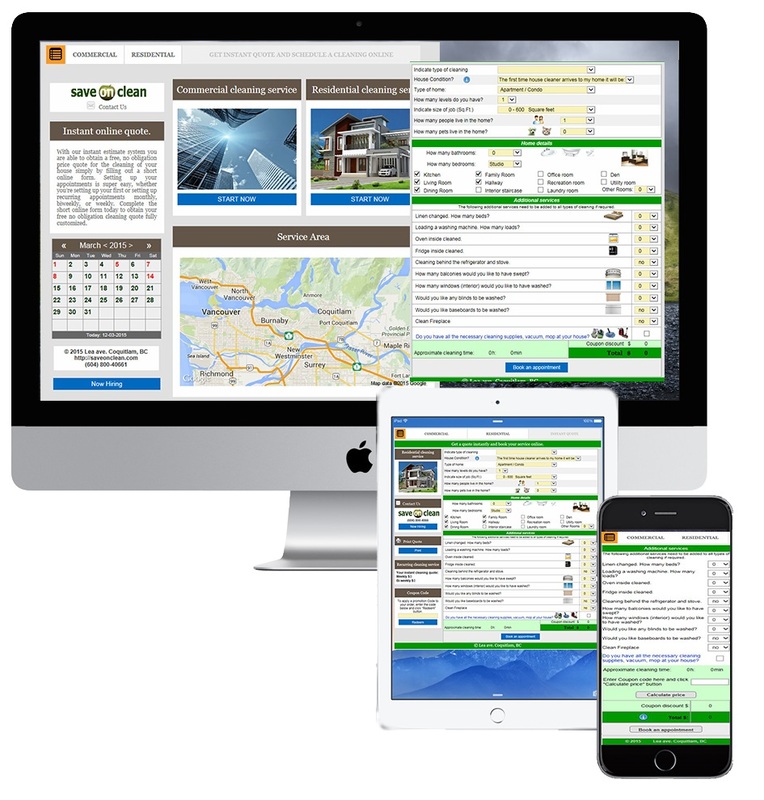 We can put any online form or calculator onto your website, such as quote generators, order forms, reservation systems, availability calendars, catalogues, shopping carts, customer feedback systems, financial calculators, expense reports...the list is endless. 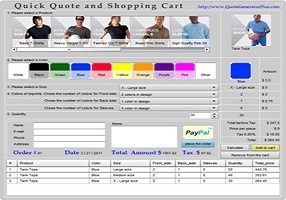 Quote Generator Plus helps you build a very professional, top quality and interactive website, which can turn visitors into clients. This is the start of a successful online presence for your business. Let your customers make an estimate and book appointments online. Increase customer convenience and loyalty while reducing your own cost. 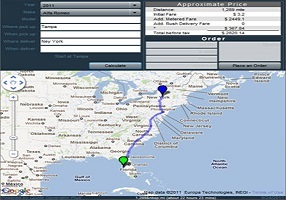 Allow customers to self-calculate prices for services and book appointments 24/7 from anywhere using a computer. This tool can be especially invaluable for small businesses, as it can be quite expensive to retain the manpower required to answer the phone 24/7, make detailed estimates, prepare work schedules, accept orders, book and cancel appointments, etc. With Quote Generator Plus you can do all of these things automatically, 24/7. After your clients have specified their requirements and checked the prices, they can send you their order directly from your web site with just a click of a button. 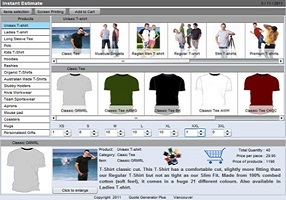 Quote Generator Plus could become one of the most important tools for a wide variety of industries, such as: Catering services, Cleaning services, Maid services, Janitorial services, Gardening, Home improvement, Renovation, Insurance, Taxi service, Limousine service, Maintenance, Moving industry, Repair, T-Shirt Screen Printing, Design Studio for T-shirt Screen Printing.